Adam Ferrara is a stand up comedian and actor, recently dubbed "hilarious!" by Entertainment Weekly. He is currently a regular on the Emmy-nominated hit FX TV show "Rescue Me" and starred in the blockbuster 2009 movie "Paul Blart: Mall Cop" with Kevin James.Adam is a regular on everybody's favorite shows: "The Tonight Show with Jay Leno," "The Late Show with David Letterman," Comedy Central, "The View," and the Opie and Anthony radio show (just to name a few).The two-time nominee for best male stand-up by the American Comedy Awards, always brings the stage to life with his honest, clever and fearless perspective on family, relationships and himself.Adam's other screen roles have included: "Definitely Maybe" with Ryan Reynolds and Isla Fisher, "Winter of Frozen Dreams" and "National Lampoon's: Dirty Movie" with Christopher Meloni.Adam began his career on NBC's "Caroline in the City." Since then, he has appeared as a series regular on the critically acclaimed ABC series "The Job," guest starred on NBC's "Law and Order" and was a frequent guest on "The King of Queens. 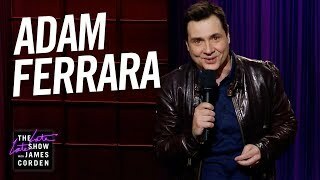 "Apart from opening for his comedy idol, George Carlin and playing Carnegie Hall, one of Adam Ferrara's most exciting moments was a benefit performance for the president and all the democratic senators. Stuck in traffic on the way to the event, Adam had this to say: "I've waited this long for health care, now they can wait for me."